Dreams really do come true!!! (Just kidding) But, really I have been absolutely dying to go to Florida and to all the parks down there. It is so accessible to us here on the east coast. Even with the cheap air fare and short plane ride, it does still cost money, which we don't have. Well, I was getting dinner ready a couple of weeks ago and had the Ellen show on when I heard a commercial for a contest to win a trip to Universal studios in Florida. I just thought I was being funny and decided to enter online. What do you know - I WON!!! There was a lot of chaos trying to get all the legal paper work in, and prove I live in Delaware, but it's all taken care of now. The trip is for next week, I can hardly wait! We get it all payed for(except food)and we get tickets to the parks and to the taping of the Ellen show in Universal Studios. The hotel looks awesome, it's actually in the park. I have a WONDERFUL mother-in-law that is flying out a few days earlier than her original trip date to come stay with Rani. We really debated on wehter or not to take her. Danny is so funny, he said -"maybe we should do it as a family vacation, Stace. We don't leave family members behind". I love it! (He absolutely loves his Rani) Anyway, I'm so excited. Danny and I have been in desperate need of a date, let alone a trip! I'm a firm believer in entering contests now! I'll be sure to post pictures when we get back. Yay!!! We finally got our new camera! It was such nice wether the other day and actually felt like spring, so I took some pictures. Rani had so much fun playing outside, now she stands at the glass doors and bangs on them and then looks at me and signs "more". She's so funny, I can't wait for more nice days to go outside and take advantage of the yard before we have to move :(! Kaylen an Marisa came up last sunday to say hi and decided they needed to give themselves pedicures. Rani was sooo interested and HAD to do it too. So I gave her a cotton pad too. She sat down and watched the girls. pretty soon I look over at her and she is taking her sock off and rubbing the cotton on her toes too! She is such a girl! Our Camera bit the dust! I haven't had any new pictures because our stinkin camera decided it was time to go to camera heaven. Danny ordered a new one on line and it is taking FOREVER to get here. Just a random picture of Rani... AND her two front teeth! Landon says she looks like a llama!! Give the girl a break, her other teeth will come in! (Whatever, Buddha!) She is so flippin funny these days. Danny and I have so much fun at night with her, just laughing at her. 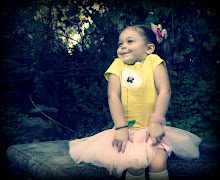 She is soooo palyful and googfy - so her fathers child. She may look like me, but her personality is all Danny! They both keep me very entertained :). It's kind of fun to look back at old pictures and see how much has changed! I can't believe how much Rani has. She was such a chunk, look at those legs! 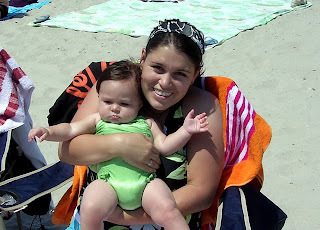 This was at Cape May beach (in Jersey). Rani was NOT a fan of the ocean, she prefers pools and tubs! 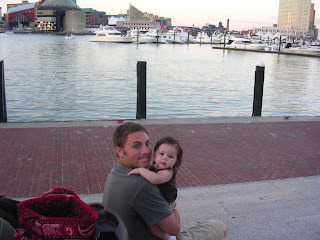 Daddy-daughter moment at the Inner Harbor in Baltimore. I love that place! The poor people that come to see us - if anyone flies into BWI I force them to stop at the Inner Harbor (sorry Shelley and Lee!) to eat at the Cheesecake Factory. It's My heaven on earth, and I don't even go for the cheesecake!